This enchanting 2 story ocean view Sea Pines home with a private, *heated pool, and spa is within walking distance to the popular South Beach Marina Village where you will find the Salty Dog Cafe, Land's End Tavern, seasonal live entertainment, and a choice of water sports. It is also a scenic bike ride to the famous Harbour Town Yacht Basin. The ocean views from the second floor will take your breath away. Enjoy them from the beautiful deck or screened porch. Hilton Head Island vacation at a reduced rate! 15% Off May 4th Week! Book 16 Piping Plover for the week of May 4th and receive 15% off! 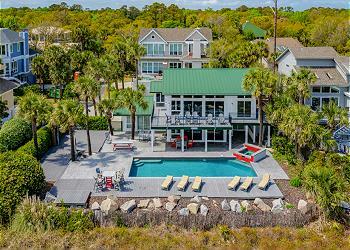 This beautiful oceanfront Sea Pines home will not disappoint! * This offer is only valid for a 7-night stay from May 4th,2019 -May 11, 2019. This offer is not valid on existing reservations or in conjunction with any other offers. Offer is only valid for 16 Piping Plover.